Chengeta Safari Lodge - Selous Accommodation. Confident that the booming tourism trade in Zimbabwe will return the focus at this idyllic retreat has been on the Zimbabwean market. This focus and word of mouth have taken Chengeta from strength to strength and their expertise now ranges from hosting conferences, wedding weekends and special team building getaways, to the ultimate safari experience around Harare. Conveniently situated, the drive is only 82kilometres from the centre of Harare on the Bulawayo road to near the small town of Selous. In less than an hour guests find themselves breathing in the tranquility and succumbing to the opulence in the lodge that captures the spirit of Africa. KuChengeta is Shona for "to take care of" and that is what every traveler and business executive can expect from this exclusive experience. Attention to detail is emphasized in every aspect of its operations, from the décor and ambience of the lodge facilities, to the cuisine and management style. Built from as many locally available natural materials as possible the lodge has been designed to enhance yet blend in with the surrounding bush. 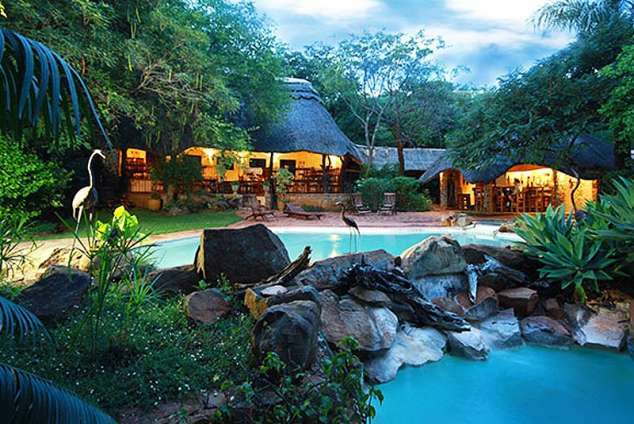 A spacious colonialist lounge, bar and indaba fireplace area all focus on cascading waters nearby. Surrounded by landscaped tropical gardens and rolling lawns there are sixteen tastefully furnished en suite rooms. And having a sauna followed by a swim in the three tiered rock pool provide another invigorating option of relaxation. The Chengeta Chefs have had an extremely challenging time diversifying into catering for large functions of various types, as well as providing sumptuous fare on a daily basis for the lodge guests. Combining only the finest fresh ingredients the cuisine has become a hallmark feature of Chengeta Safari Lodge and something that guests have come back for time and time again already. One of the largest private game reserves in Mashonaland this is unspoiled Africa at its best. In excess of 45 species of mammal and over 180 bird species thrive here. The spectrum vegetation types in the park provide a prime backdrop and interesting terrain for walking and horseback safaris. Stimulating game drives and canoe safaris are tailor-made in distance and content to suite the interests of those participating. Passionate about wildlife and sharing their knowledge of nature the professional guides provide the ultimate all round bush experience. Simply, "taking care of" their guests, animals, environment and their families is what "Chengeta Safari Lodge" is all about. 35812 page views since 19 Feb, 2002.